The National Audubon Society is one of the sponsoring partners of eBird, so I am delighted to see that the Audubon Birds app just came out with an updated version that allows users to "Find Birds with eBird". 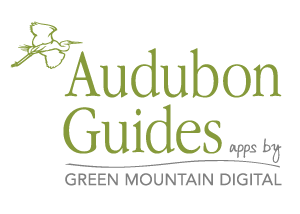 The impressive series of Audubon Guides apps are developed by the friendly and enthusiastic folks at Green Mountain Digital. With this new eBird integration, they have taken one giant leap, making this digital field guide the most useful app for finding and identifying birds. Finding birds with eBird on this app is so slick and intuitive. You select your location and then can choose to "Find Birds Nearby", "Locate a Bird" (by species), search for "Notable and Rare" birds in the area, or "Find a Hotspot with Observations". I put this app through its paces by imagining I was visiting a new city and wanting to find out where the local hotspots were and what birds had been seen in the last 30 days. Everything I wanted and needed was there in this one awesome birding app! Audubon Birds using eBird data seemed extremely user-friendly to me, but I wanted to find out how intuitive this app really is. So, I tested it out on my non-birding kids: Kyle (10), Anne (9), and Victoria (7). I gave them challenges to use the eBird tool in Audubon Birds to find the most recent and nearest sightings of certain target species. Kyle and Anne were able to find the species faster than I could. It was like second nature to them. The younger Victoria struggled a tiny bit more simply because of less reading experience. However, even Victoria was able to pull up recent sightings of Common Goldeneye...and I rejoiced to see that the two Goldeneyes I had reported at my lunch-hour birding patch earlier in the day already appeared up on the map! With real-time information like that, this is the kind of useful tool that all birders will want. What's more is that my kids really loved playing around this app and couldn't get enough of it. They, like me, enjoyed the pictures, maps, and the beauty and ease of it all. Cool gadgets like this will interest more kids in birds and nature. * All new photos - 3,150 of them - with a renewed effort to show not just pretty pictures, but photos showing diversity in gender, age, and seasonal plumage. * You can share your sightings with your friends directly from the app using email or Facebook. So, all the more reason to own and use the Audubon Birds app and to be an eBirder! I love it. Audubon Birds is listed for $19.99 in press materials, but is currently on sale for $14.99 on the iTunes until the 30th of this month. * This app is officially called "Audubon Birds - A Field Guide to North American Birds" in the iTunes store - Click here for my review of an earlier version of Audubon Birds for Android. * Sightings records in this app are not attributed to eBirders by name as they are on eBird website. * Peterson Guides also has an app with a "Bird Finder" tool which uses eBird data, but I have not had a chance to see it or test out its functionality. * The generous people at Green Mountain Digital let me borrow one of their iPads for a day with the app pre-loaded for this review, but no other compensation was provided for sharing my honest opinion. * Debate will still continue regarding how useful these apps are for identification - photos vs. illustrations. We birders are getting spoiled with this awesome digital stuff and we're now hoping to have apps with both photos and illustrations along with the sounds and calls all in one easy to use place.